Please urge your government representatives to take action to protect wild animals. In the US, send your letter to your US Congress members. In the UK, send your letter to the George Eustice MP, Minister of State at the Department for Environment, Food and Rural Affairs, and to your local MP. I am writing [as a constituent] to ask that you please take action to protect vulnerable and endangered wildlife. As you are likely aware, the biennial CITES Conference of Parties (CoP17) will begin on 25th September 2016, where delegates will decide which species need further protection, and which will suffer further killing and trade in their body parts or live exports. I’m asking you to support the proposals that will give these animals the highest level of protection and oppose those that will put them in further danger. Up-list all lion populations to Appendix I status to restrict the international trade in lion body parts, combat trophy hunting, and enable countries to facilitate enforcement efforts. 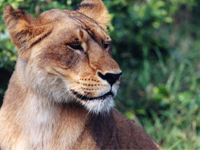 Lions now occupy only 8% of their historic range – this up-listing is vital. Up-list all African elephant populations to Appendix I status. In Africa, 100,000 elephants were killed for their ivory between 2010 and 2012 – we must send a clear message of global determination to prevent their extinction. Oppose the proposal to amend Appendix II to allow the trade of southern white rhinoceros horn from natural deaths, recovered poached horn, and harvested from live animals. This amendment would undermine international and domestic bans and complicate enforcement; it could also encourage trade and provide a route for laundering illegal horns. Include Barbary macaques in Appendix I. As the most seized CITES mammal in the EU, accounting for 25% of live mammal seizures, Barbary macaques must be given the highest level of protection to stop their capture for use in the international pet trade and as tourist photo props. International trade restrictions must be implemented if we are to halt the extinction of our wildlife – CITES CoP17 is our chance. Thank you for your public service and I look forward to hearing from you on this matter.